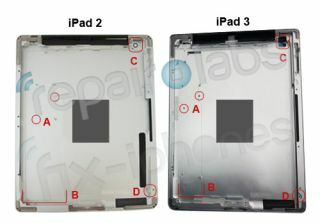 A casing supposedly created for the iPad 3 has been ruthlessly photographed and posted online, with its size suggesting we're in for an increase in battery and graphics power in the new Apple tablet. The first being the size of the logic board – the iPad 3 casing has less room for this, which Fix-iPhones.com, the hithertofore unheard of site that acquired the pictures, reckons means we'll see the extra space taken up by a larger battery. Perhaps most interestingly is the fact that the casing allows for a 'redesigned' display, which could mean we'll see that high-res super-screen that's been rumoured for so long after all. As usual with Apple rumours, we prescribe a hefty does of salt be taken alongside this latest speculation – there's no way of verifying that this is the iPad 3 casing or if it even came from Apple's manufacturers at all. Although some of the suppositions do jive with other rumours, nothing is certain until we hear it from Apple itself. So we'll stay comfy here on the fence where we feel that it's quite likely that at least some of this is true.